Full price admission for one participant to the Environmental Gathering. If two participants are attending from the same organization, they are eligible for a $50 discount. If three participants are attending from the same organization, they are eligible for a $100 discount. Please join us at the First Annual Environmental Gathering: “Change the Climate”. It's time to change the way we work together. There has never been a better time to convene Alberta’s environmental champions. We now live in a new political and economic environment. Both the obstacles and the opportunities for Alberta’s environmental organizations are incredible and we need to change the climate of how we collectively identify problems and execute strategy. As a champion for the environment in Alberta, we invite you to join us over three days in February to explore new opportunities to work across sectors. We anticipate over 200 participants in our initial gathering, likely 80% from environmental organizations, and 20% from government, the business community and other funders. At this event you will be able to connect with your peers and like-minded individuals from across the province in meaningful ways. WHO: Alberta Ecotrust Foundation is a longstanding, unique and strategic partnership between corporations and environmental organizations. Together, we invest in nonprofit environmental projects, strengthen the ability of the voluntary sector to affect positive environmental change, and facilitate collective and cooperative action on the environment. With our deep insight and access to this community, Alberta Ecotrust is well positioned to gather the sector together in one place to improve how ENGOs connect in meaningful ways with each other, with industry and with government. 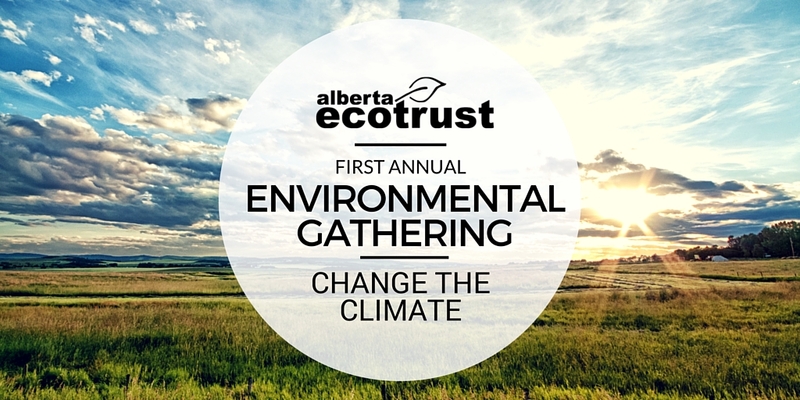 PROGRAM: Program details and keynote speakers are http://albertaecotrust.com/gathering2016/. BURSARIES: Alberta Ecotrust is pleased to offer a limited number of bursaries to help participants attend the Environmental Gathering. If you require financial assistance please download and complete our Bursary Application Form and submit it to Natalie Odd at n.odd@albertaecotrust.com. ACCOMMODATION: We have secured discounted rates with Delta Calgary South as well as the Grey Eagle Resort and Casino for the Environmental Gathering. Delta South offers a a lower rate ($114/night) whereas the Grey Eagle ($149/night) offers greater convenience as it is located a short distance from the venue at Mount Royal University. Book with Delta Calgary South. Learn more about the Grey Eagle and our discounted offer or book directly now. For 25 years, we have been facilitating action on the environment in Alberta. There is no other organization in Alberta, or Canada, who focuses entirely on bringing industry and nonprofits together to protect the natural systems we need to thrive. Water. Land Use. Climate Change. These are the environmental priorities Albertans have told us they most care about, so they have become our priorities, too. We support the people and organizations working to protect them, and we invest in projects that either directly or indirectly improve the way they are managed and preserved. And we provide the tools necessary for Albertans to be responsible stewards of the things they care about.